I asked you to tell me what this was from and you haven’t disappointed! Cromercrox led the charge by deftly discounting it as being from a tetrapod – and even after an attempt at obfuscation on my part he identified that it was from “some mutha of a fish”. Jack Ashby jumped in with the correct suggestion that it was from a perciform fish and Jim slammed home with the correct answer of wolffish (AKA seawolf, wolf eel, sea cat or Anarhichas sp. Linneaus, 1758). Neil also correctly identified it as Anarhichas. So congratulations to everyone on a nice piece of group deduction! 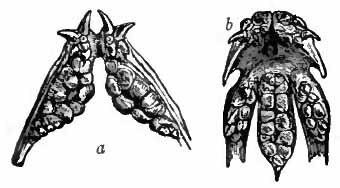 Drawing of the teeth of the lower and upper jaws of the seawolf (Anarhichas lupus). 1911 Encyclopædia Britannica, Vol. 24, p. 566. 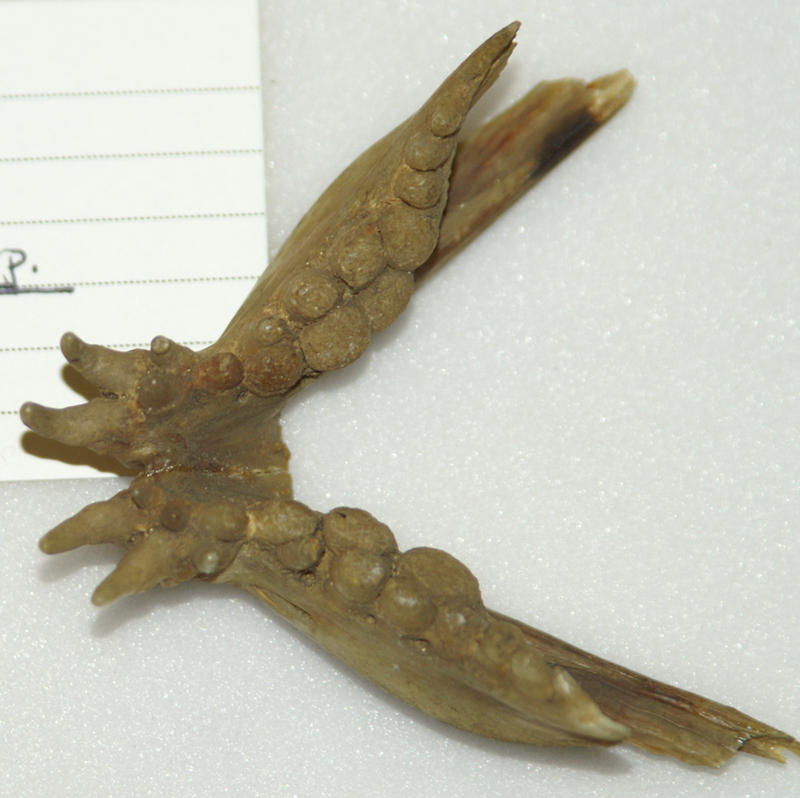 As you can see, figure a is a very good likeness of the specimen, clearly showing the large and robust dentition of this fish – a dentition that is regrown annually to counter wear. The front teeth are used for grabbing molluscs, echinoderms and crustaceans, which are then crushed using the big rounded teeth to the rear of the jaw. Here’s a video of a wolffish eating a sea urchin, spines and all (apologies for not embedding – WordPress and Vimeo don’t seem to talk to each other very well). Wolffish are pretty big (up to 1.5m and 18kg) and they can live in waters of -1.3 degrees Celsius, due to an antifreeze compound in their blood. They live in and around rocky sea beds of the Atlantic, usually between 80 and 120m deep. The males guard their eggs for up to 9 months after they have been laid, during which time he doesn’t feed. Now that’s dedication! There’s a good summary of information about wolffish, with references, here. I thought it was a mutha, and what an evil looking mutha it is.